So at any rate, this makes posting even more painful than usual. In fact, this entry is being composed and uploaded on my iPhone! CK is looking into it and hopefully we’ll have it straightened out soon but in the meantime I’m just going to have to leave you with the above image of my messy kitchen. Those are the groceries I picked up today and have been slowly turning into food for a belated birthday party for Mr. Kelly tomorrow. All of the chopping and slicing gave me a blister on my index finger though so I’m taking a wine break. I think it’s safe to say that I’ve been eating out a little too much lately — even my hands are shaming me. Happy Friday! Oh noes! Sorry for the woes 🙁 I hope you post whatever you make for the birthday celebration. 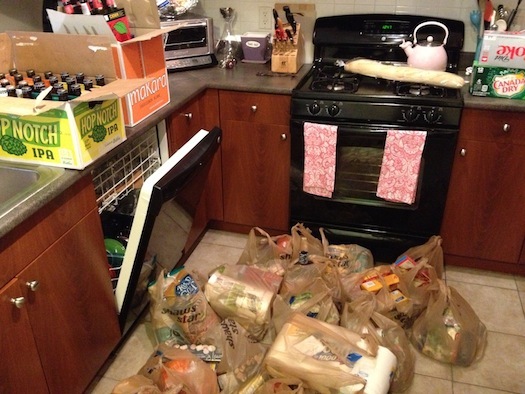 From that pile of groceries, it looks to be a wonderful feast! I will happily offer up my house (and my kitchen!) to help ease your posting woes. Love and miss you! Excuses, excuses 😉 Drinks soon, please? Hey that’s my flooring in your kitchen! We just put down some grip strip vinyl laminate flooring in all the basement rooms that looks just like that. You know what I thought when I saw that pile of shopping bags on your floor? The lady needs some of my t-shirt totes for hauling all her groceries! Want some? Just send me your addy and I’ll send a few your way! We’ve got far more than we can use and DH keeps using plastic anyway so he has bags for the used kitty litter. That’s a sweet offer Sharon but I actually do have a huge number of fabric bags already I just happened to totally forget them that day 🙁 If I don’t leave them in the trunk of the car I have the worst time remembering to take them with me. Whole Foods used to have a huge banner above the front door that said, “Did you remember you bags?” I miss that — ha ha.